Though Inside Trail’s passion lies with off-road competition and adventure, we cannot overlook outstanding performances in our cousin sport, road racing. First, congratulations to Lizzy Hawker in her jaw-dropping run at the 2011 Commonwealth Mountain and Ultra Distance Running Championships 24 hour race in Llandudno (North Wales). Just four weeks after winning the grueling UTMB, Lizzy covered 246.4 km (just over 153 miles) in the 24 hours, breaking the 18 year old world record held by Germany’s Sigrid Lomsky by three kilometers. Of course, we must also tip our trail hats to Patrick Makau (Kenya) for setting the new marathon world record with his 2:03:38 run in Berlin, beating Haile Gebrselassie’s record by 21 seconds. Also racing in Berlin, Haile must have instinctively sensed that Makau was having a special day because after Makau made his move, Haile backed off, bent over, then resumed running and finished. Here in the US, the Bear 100 trail race continues to evolve into one of the classic hard-nose races on the 100 mile calendar. An exciting race from the start saw a group of eight pull away on the initial 4,000+ ft climb to the first aid station in just over two hours. As contenders dropped away from the steady Nick Pedatella, Ben Lewis and Gary Gellin, who seemed to focus more on tactical racing than pure speed with each of them also getting lost at times. In fact, near the end of the race, Pedatella ran off course, allowing Ben Lewis to take the lead. Pedatella recovered the correct course and the lead, winning in 20:55. Lewis came in shortly thereafter in 21:18, and Kelly Lance put in a breakout performance and a study of perfect pacing to take third in 21:29. Remarkably, both Lewis and Lance had never run a 100 miler previous to Bear. For the women’s race, Nikki Kimball dominated from the start en route to a substantial new course record in 22:19. Jane Larkindale, in her first 100 miler since her 2010 San Diego 100 win, came in fresh and obviously well-trained to take 2nd in 23:25 and Ellen Parker rounded out the top three with a solid 23:53, also earning the Wolverine Club sub 24 hour buckle. Full results here. The UROC (Ultra Race Of Champions) took place this weekend and though many elites were not in attendance, it didn’t stop the ones there from having an exciting race. Huge congratulations to Geoff Roes and Ragan Petrie on their wins. The noticeably low-key, at least in terms of exposure, USATF 50k National Trail Championships took place Saturday in Bend, Oregon with recently crowned World Trail Champion Max King taking the men’s title by a comfortable margin in 3:27. In a more tightly contested race, Stephanie Howe took the women’s national title in 4:19. Both King and Howe live in Bend, OR. “Mike was at 156+ miles but was still moving well with 1 hour left…I would estimate he had sped back up and was doing 8 minute miles. I wouldn’t be surprised to see him at 163-164 miles when the final results are posted…within just a few miles of the American Record (which are typically chased on flat pavement with much fewer runners in the way, and in better temperatures). And finally, check out Go Trail Magazine’s October issue, released today. Inside Trail has a monthly column beginning this month. The magazine is top notch with terrific articles and stunning photos. Hope you enjoy it! Bear 100 Elevation Profile. That first climb is a grunt and that last descent, well, hope your health insurance is up to date. 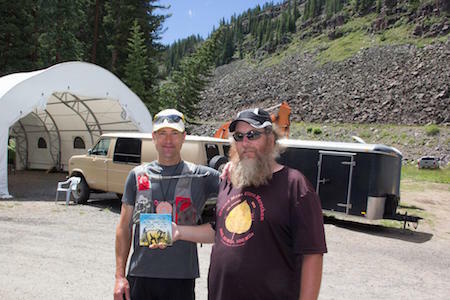 If one yearns for the grassroots, rustic 100 miler of yore, then look no further than the Bear 100. The bare nature of Bear is by design. Race Director, Leland Barker, is old school and likes his race that way too. Leadville, especially under new management, seems to cradle the runners, providing everything, short of carry them to the finish, for a fairly easy out-n-back jog. Bear is a stark contrast and I, for one, love it. 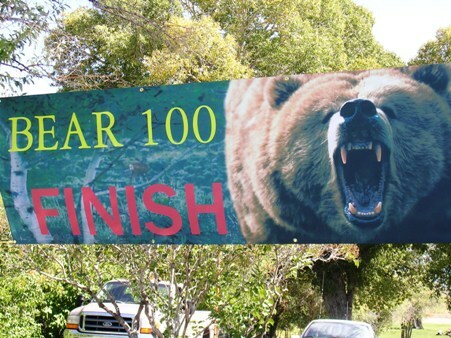 The Bear 100 began in 1999 with 17 starters and zero sub 24 hour finishers. Last year there were 157 starters and a record 17 sub 24 hour finishers. You may get the idea that it’s a tough course and you’d be correct. The course begins in Logan, Utah and, after an obscene amount of climbs and descents, it finishes at Bear Lake in Idaho. It’s both stark and harsh. Did I mention I love it? The whole production starts with the no nonsense website that provides the essentials (schedule, location, important updates), then moves on to the race briefing, with the emphasis on “brief” where participants have the pleasure of characters like Errol “Rocket” Jones, Phil Lowry, and Leland Barker casually mentioning things like, “The course should be marked well enough to follow” and “watch out for herding cattle”. I literally had just found a spot on top of a picnic table to plop down and the briefing ended with, “We’ll see you folks at 6am. Thanks for coming!” A short, funny story of how laid back this whole thing is: Last year’s Bear was my first 100. I was nervous (scared) but confident enough that I bought a belt, ready to attach my new finisher’s buckle. I was so excited the day before the start and could barely relax long enough to think straight. At the end of the pre-race briefing Leland wraps up then says, “Oh yeah, I forgot to order the buckles. I hope you all understand.” I received my buckle on the verge of Thanksgiving, six weeks after the event, fat and lazy from taking a month off of running. My custom belt barely fit but I wore the buckle proudly for a week, then realized it was fairly uncomfortable wearing a heavy, brass buckle and stiff, leather belt. That’s an indication of the relaxed nature of the event. The whole experience is such a bright image in my memory that I was one of the first to register again this year. The course is marked well enough, save for the errant and angry ATVer who may re-route or otherwise vandalize sections (extra adventure at no cost). Frankly, the difficulty and beauty of the course overshadows any worries about race organization. The race begins with a hands-on-knees, 4,000 ft climb at which point you top out close to or just after sunrise and are rewarded with an amazing view of Logan, UT way down where you began the day. The first 50 miles take up roughly 15,000 ft of the 22,000 ft total climb. It’s a nice thought when you’ve reached Tony Grove aid station at 52 miles, knowing you’ve completed so much climb and ‘only’ have 50 miles and about 7,000 ft climb left. I won’t go into the hideousness of the final 9 miles of the race. Let’s just say, aspirin and ice will be your ankles’ friends for a while. Nikki Kimbal – From Bozeman, MT. The women’s record at bear is 23:37, set by Rhonda Claridge, who is the only woman to run under 24 on the new course (since 2009). Only two women in the history of the race have run under 24. Look for Nikki to run two hours faster than that. Jane Larkindale – From Tucson, AZ. If Nikki takes too long to sneeze on the course, Jane will pounce. After running undefeated in 2010 with impressive times at such races like San Diego 100 and Zane Grey 50, she hasn’t laced up the trail racing shoes this year. She’s either going to be incredibly fresh or stale, no middle ground. Ellen Parker – From Seattle, WA. Ellen should round out the top three. She ran to a 4th place in 26:18 at the tough Pine to Palm 100 last year and has had a light year of racing in 2011 with a 3rd place at White River 50 in July. Nick Pedatella – From Boulder, CO. After a two year hiatus from the top step of the podium, this is Nick’s race to stand tallest at the awards ceremony. His true potential competition would’ve been Karl Meltzer but after a bold run at Wasatch earlier this month, Karl is resting his back injury and will be at the Bear in the capacity of crew for Mrs. Speedgoat. At just 26 years old, Nick has built solid experience, including eight 100 mile finishes; not just finishes but solid performances: 5th at Hardrock, 14th at UTMB, 6th at Leadville, 6th at Wasatch, and 2nd here at Bear 100 where only Geoff Roes crossed the finish before him. Even when he has a bad day, he seems to hold it together for finishes most runners would kill for. Todd Gangelhoff – From Morrison, CO. I’m going out on a fairly sturdy limb here in this pick. Karl and others will likely disagree and place some of the untested speedier guys in front of Todd but, as I mentioned to Karl, Todd reminds me a lot of Erik Storheim in terms of running style, speed, and toughness. Those are the ingredients for success at Bear. I did a big 6.5 hour run at 12-13,000 ft with him two months ago and he lead the way with an impressive base of fitness. David La Duc – From Oakland, CA. David’s put together a big season, capped with an 18:01 run at Western States. He’s a quick guy and prolific racer. It’ll be interesting to see how he runs in real mountains. I’m obviously guessing he’ll do well. Mick Jurynec – From Salt Lake City, UT. At some point in the picks, I have to go with someone familiar with the area and Mick is the hometown guy. A couple of key indicators are his runs at Wasatch 100 last year (5th in 22:21) and Squaw Peak 50 this year (3rd in 9:25). Gary Gellin – From Menlo Park, CA. Gary is full of speed. Way Too Cool in 3:35, Firetrails 50 in 6:43, Quicksilver 50 in 6:29, White River in 7:11… the list continues. One thing that stands out as a 22,000 ft speed bump in his way is the lack of any race beyond 50 miles. 100 miles isn’t just double 50 miles. It’s a different world and it’s impossible to extrapolate, for both the spectator and the runner, what will happen. Giving him 5th here on this course, with these experienced guys is giving him the benefit of the doubt. Tim Long – Boulder. It seems odd giving myself odds but, looking at the entrants objectively, I have to give myself a place in the mix somewhere. This will be my 5th 100 miler since June (San Diego, Hardrock, Grand Mesa, Leadville so far). This has also been the longest break between 100s (five weeks), so I’ve been able to get into a real training block following a two day rest after Leadville. I ran 23:05 for 9th overall here at Bear last year. It was my first 100, so I was cautious, made mistakes, ran off course, and enjoyed the day like nothing I’ve ever experienced. So, my enthusiasm, fitness, and focus on this particular race has to count for something, right?